ISWC 2014, the eighteenth annual International Symposium on Wearable Computers, is the premier forum for wearable computing and issues related to on-body and worn mobile technologies. ISWC 2014 brings together researchers, product vendors, fashion designers, textile manufacturers, end users, and related professionals to share information and advances in wearable computing. ISWC 2014 will be held September 13-17 in Seattle, Washington, collocated with Ubicomp 2014. Selected accepted designs will be exhibited at Microsoft Research Studio 99 in Seattle for six weeks following the conference. ISWC 2014's Juried Design Exhibition invites submissions of original works of wearable technology and/or novel applications for new audiences using existing technologies. Submissions may comprise any type of wearable technology (electronic, mechanical, textile and garment-based, etc). Awards for the best design will be given in three categories: Aesthetic, and Functional and Fiber Art. Submission Deadline: May 30th, 2014, 11:59pm PDT. Submissions to this category should be functionally-focused wearable designs, aimed at using technology to solve a particular problem or meet a specific need. Submissions to this category should be aesthetically-focused wearable designs, aimed at developing an aesthetic or visual effect through the use of technology. Submissions to this category should be non-wearable, but textile- or fiber-integrated innovations. Fiber arts submissions may be functionally or aesthetically focused. Confused about which category to pick? Many designs address both functional and aesthetic aspects of a problem. Designers should consider in which aspect their design is strongest, and submit it to that category. Awards for the best design will be given in three categories: Aesthetic, and Functional and Fiber Art. Winners will receive a fabulous prize package from SparkFun and Plug&Wear. Also, a selection of the best designs from the ISWC 2014 will be exhibited at Microsoft Research Studio 99 gallery. A reception for designers at Studio 99 to open the Microsoft Research exhibit will be held on Thursday 9/18, following the ISWC conference. Designers are asked to submit an illustrated design statement detailing the work's concept, motivation, intended audience and end-use, technological functionality, and execution. Detailed images must illustrate the text. Please submit your document as one compiled PDF file, formatted according to the ACM extended abstracts format. The submission should not exceed 6 pages, including embedded images. All figures should be included in the document body and referenced in the text. Please cite all references used in the text according to the ACM formatting instructions. Your submitted PDF should not exceed 6 pages or 5MB. Please prepare your paper for blind review: do not include any names or institution affiliations within your submitted PDF. Email your submission to design@iswc.net. In the subject line of your email entry please start with: ENTRY – CATEGORY (aesthetic, functional, or fiber art) – Your Project Title. In the body of the email please include your contact information, a list of the authors of the submission and their institutional affiliations (in the intended order), and the PDF submission. Supporting documents are suggested at the time of submission (will be required for accepted authors), and include high-res images and video to be used in the exhibits at ISWC and Microsoft Research Studio 99. Please note: Accepted designs will need to for shipped/transported to Seattle, to arrive on or before September 14th, 2014. Authors will be responsible for return shipping from Seattle following the conference or the close of the Microsoft Research Studio 99 exhibit (for accepted Studio 99 designs). How novel is the concept or application? Has it been done before? Is the approach novel? The work should exhibit depth of understanding and insight. How innovative is the use of technology: have advances been made in the use of standard tools for a new purpose? Have new technologies been developed? 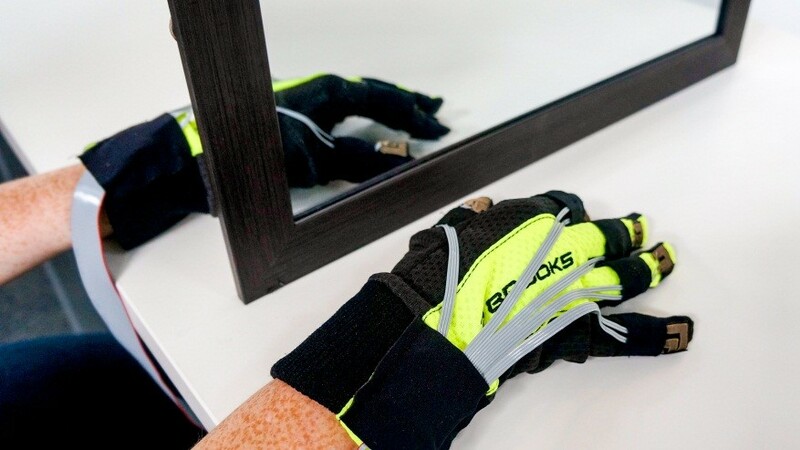 What does the technology bring to the wearer or the viewer in the wearable environment? How professional and polished is the finished product? Have appropriate or novel construction techniques been implemented? How have standard hardware components been adapted for the wearable environment? How well have the concept, novelty, and use of technology been communicated? Is the idea and process evident in written and visual materials? 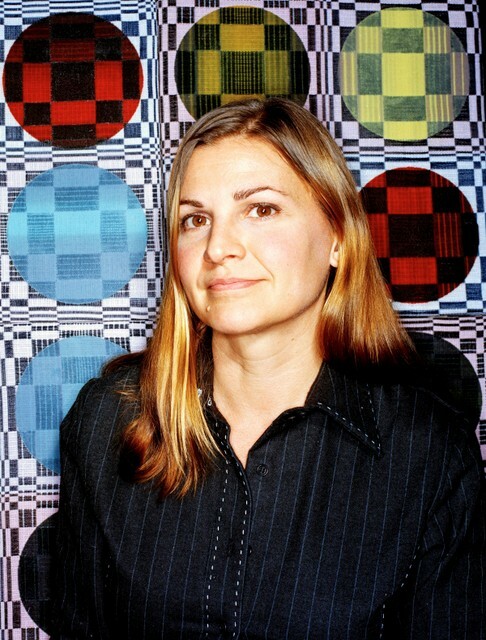 Maggie Orth is writer, artist, designer and technologist who- from 1996 to 2012- created interdisciplinary art, design, and research focused on electronic-textiles. Orth’s creative work in e-textiles includes early consumer products, like the POM POM Wall Dimmer, early e-fashions, color-changing textile artworks, and interactive touch-sensing and light artworks. Her e-textile research includes fabric touch sensors, data transport, antennae design, heating, and thermochromic displays. 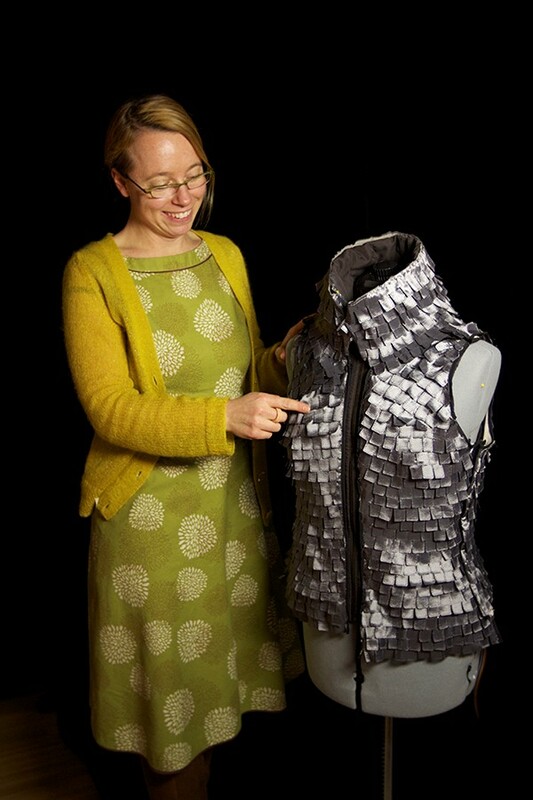 Orth began her work in e-textiles at the MIT Media Lab in 1996, where she created early research in wearable computing, e-textile sensing, and e-fashions, including the Firefly Dress and Musical Jacket. After receiving a PhD from the MIT Media Lab in 2002, Orth founded International Fashion Machines, Inc. (IFM), an electronic-textile studio and company. Orth’s goal at IFM was to get e-textiles out into the world, to develop them as both a beautiful creative medium and emerging technology. Her practice at IFM combined product design, art, engineering, intellectual property development, technology commercialization, and entrepreneurship. At IFM she created some of the earliest e-textile products, including the first UL-Listed e-textile product, the patented POM POM Dimmer. Orth holds a BFA in painting from RISD and PhD from the MIT Media Lab. Orth has written patents, conducted DARPA research, contracted for fashion companies, and created artworks. In 2007, Orth received the prestigious USArtist’s Target Fellowship. Exhibition venues include: Cooper Hewitt National Design Museum, San Francisco Museum of Craft + Design, Wexner Center for the Arts, The National Textile Museum, The Stedelijk Museum, SIGGRAPH, Ars Electronica. in Seattle, WA. Orth is now retired from electronic textiles and writing fiction in Seattle Washington. 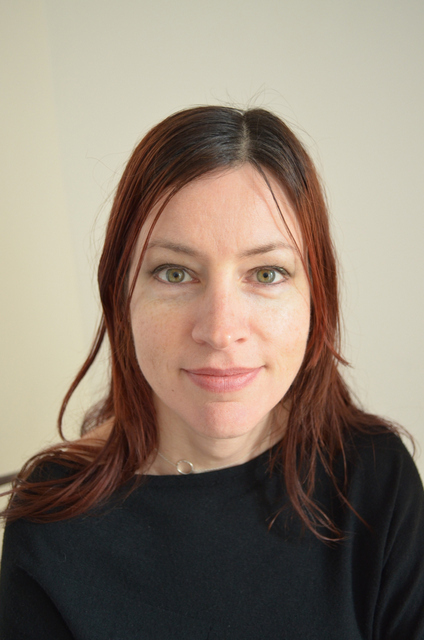 Asta Roseway is a Research Designer, at Microsoft Research, whose work focuses around Human Computing Interaction (HCI), Affective Computing, and Wearable technologies. Roseway's highly regarded 'Printing Dress' (ISWC 2011 Expo winner), is a combination of fashion and technology designed to provoke questions around wearable displays, privacy, and social impact. She continues to explore these questions but more specifically focuses on experiences within the health and wellness sector. Asta is one of the co-founders of studio99, a Microsoft Research effort designed to bring Art and Technology practices closer together. 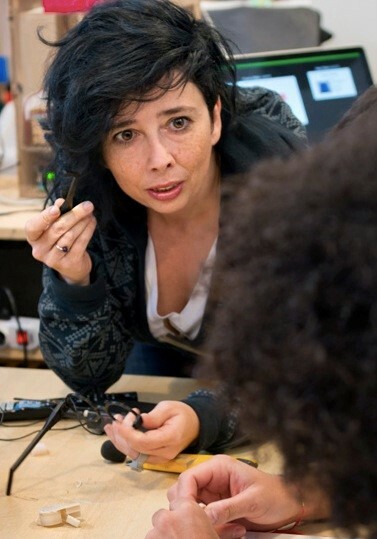 Zoe Romano lives in Milano and currently working on Digital Strategy & Wearables at Arduino. She co-founded Openwear.org, the european pilot project around collaborative fashion and open source branding and Wefab.it, an initiative for the diffusion of open design and digital fabrication in Italy. She's been into media activism and political visual art for the past 10 years, working on precarity, social production, material and immaterial labor in creative and service industries. She recently launched a Makerspace in Milan called Wemake.cc, focused on contemporary fashion and design practices. Meg Grant (NZ/US) is a designer, technologist and maker, researching smart textiles and wearable electronics. She is active in the Arduino and open source hardware communities and is a contributing editor to fashioningtech.com. She has taught Smart Textiles and Fashion Technology at Willem de Kooning Academie in Rotterdam and her work has been featured on numerous blogs and publications, including Wired Online, Trend Hunter and CNET. Her work has been exhibited in Europe, the UK and Canada and her collaborative project for a photovoltaic yarn (Solar Fiber) was featured at both Dutch Design Week and the NeMo Museum energy innovation exhibition. She currently conducts independent research into textile-based electronics and consults to wearable tech business from her studio in San Francisco. All submissions will be evaluated by the jury panel for their following design elements, as outlined above: concept, use of technology, execution, and visual/written communication. Aesthetically-focused designs will also be evaluated with respect to their aesthetic novelty and appropriateness for the intended purpose, and functionally-focused designs will also be evaluated with respect to the usability of the technology for the specified audience. Accepted works will be exhibited at the conference venue, and accepted exhibitors may be asked to supply additional visual materials to accompany the exhibition. Designers will assume the cost of transporting their work to and from Seattle, to arrive before September 14th, 2014. Design statements from all accepted designs will be included in the ISWC Adjunct Proceedings. Prizes will be awarded at the conference for the Aesthetic, Functional, and Fiber Arts categories. The Studio 99 curators will select a sub-set of accepted designs for exhibition in their gallery space for 6 weeks following the conference. Selected designers will be invited to submit their work for publication in Fashion Practice: The Journal of Design, Creative Process, and the Fashion Industry (published by Bloomsbury Publishers). For questions regarding the ISWC 2014 Design Exhibition, please mail the Design Chair, Troy Nachtigall, at design@iswc.net.